What do you get when you take 14 helpings of StencilGirl and mix that with 14 helpings of Emerald Creek? Well the answer is magic of course. And one major blog hop and giveaway. Emerald Creek and StencilGirl are truly a match made in heaven. Both are small, family-owned and run companies. Each has taken a traditional craft product (embossing powder/stencils) and applied their own very special spin. So come celebrate this pairing by seeing the amazing artwork created by 14 talented artists. Oh...and did I mention there is a giveaway (scroll down for info)? My contribution to the hop was created using one of my all-time favorite stencils, Creative Halo designed by Pam Carriker. 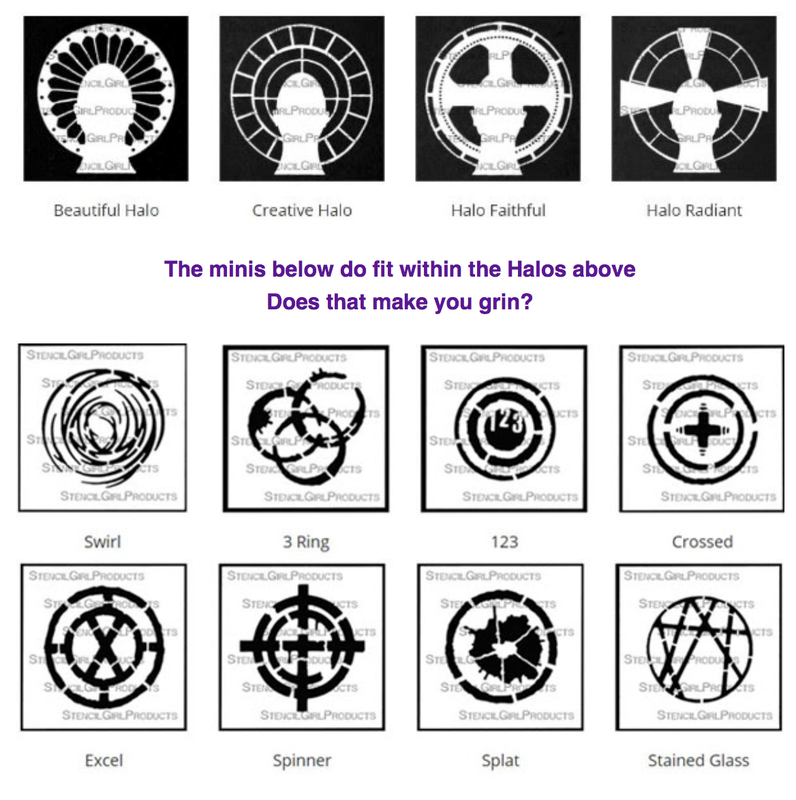 She has 4 stencils in her Halo series and by total synchronicity, my mini circle stencils fit inside the halos, given you many more creative options. Working on a painted sheet of watercolor paper, I used a sponge to press adhesive from an embossing pad through both the halo portion of Pam's stencil and my Crossed stencil. 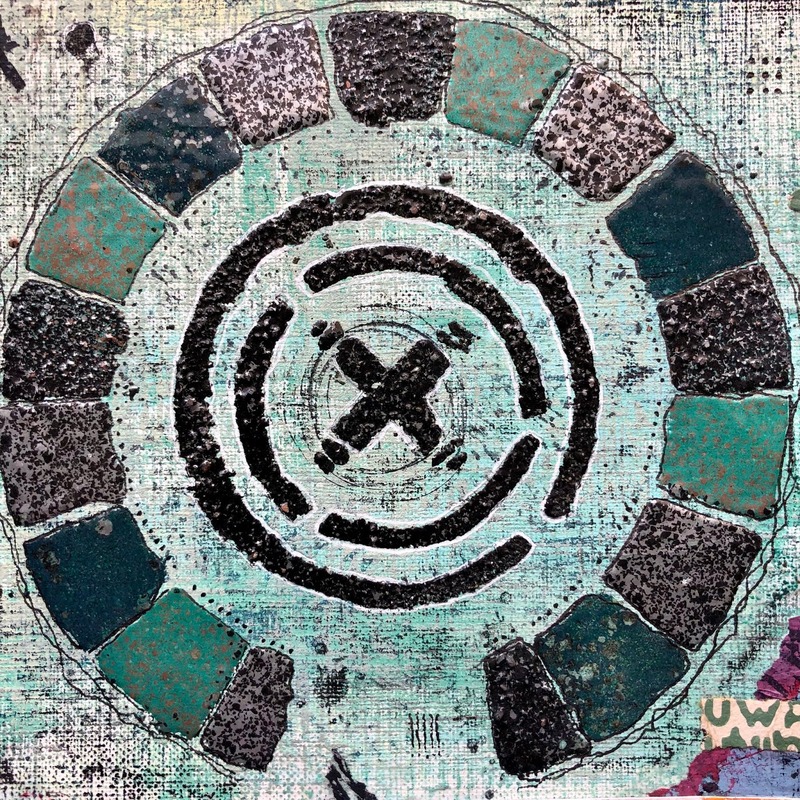 My stencil was then embossed with Rocky Road Baked Texture and the squares in the halo were embossed with Deep Sea Baked Texture, Patina Oxide Baked Texture, Rocky Road Baked Texture and Hammered Metal Embossing Powder. Collage and much mark making were then added to the surface. The word Possibility, from my new Impression Obsession Journal Jargon 5 stamp set was the finishing touch. One lucky winner will receive $50 in Gift Certificates to Emerald Creek and StencilGirl Products! Then be sure to visit the other blogs in the hope and comment to win. StencilGirl Products Facebook page and Emerald Creek's Facebook page on Wednesday, August 22. Fabulous work as always Seth. Love the combination of yours and Pam's stencils as well as the embossing powders! Beautiful! Love the colours off the embossingpowder you have used. Fab piece made more interesting with the different embossing powders used in the stencil shapes. I absolutely love your color combinations and textures in this! Hands down, this is one of my new favorite pieces! 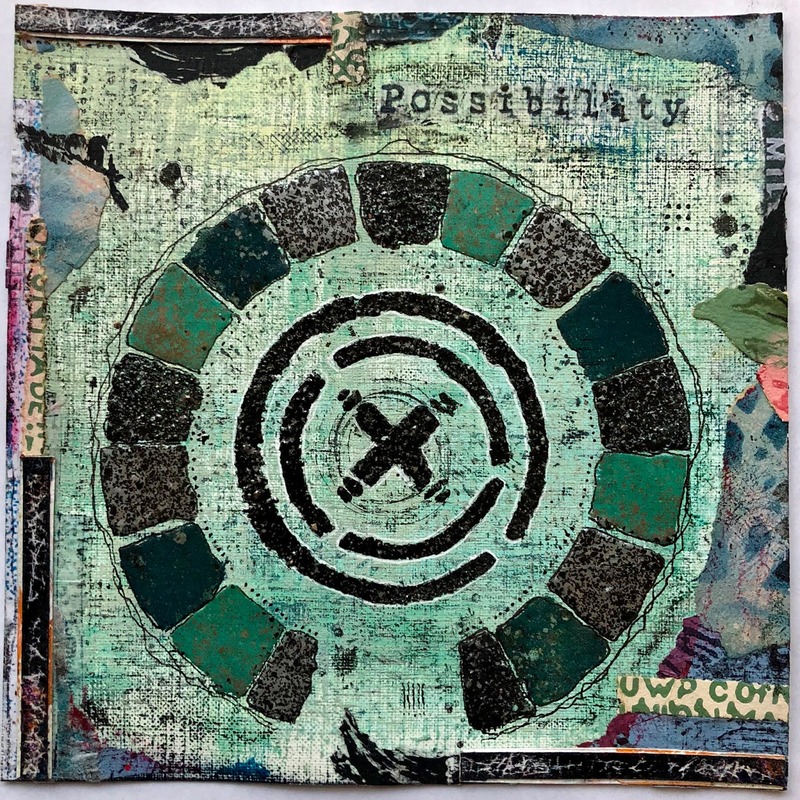 So cool that your mini circle stencils fit inside Pam Carriker's Halos...another match made in heaven. Love the way you used the halo stencils, which are on my shopping list. 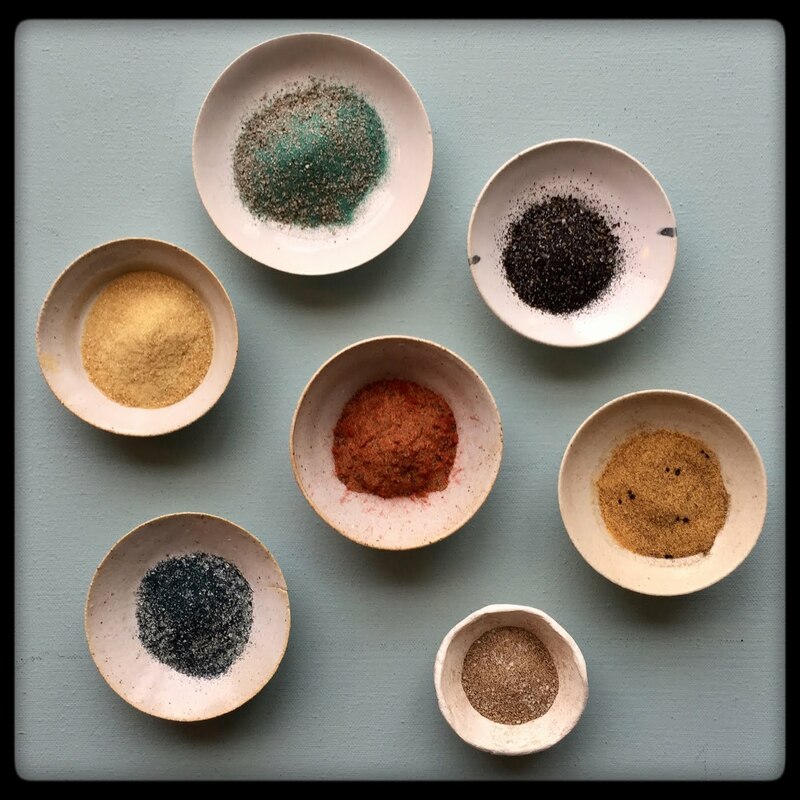 Love your work and especially the baked texture embossing powders! Beautiful color and texture. Thank you for sharing. Wow - your embossing powders are just mind boggling. Thank you for your seriously inspirational art. This is amazing! I love the variety of colour and the beautiful stone textures. 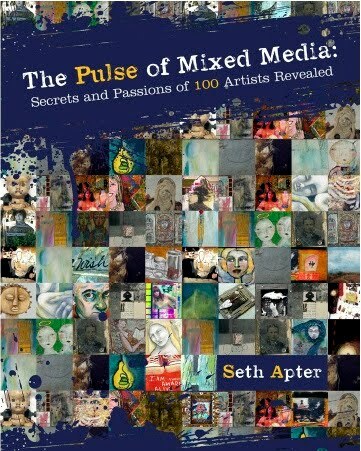 Your poewders rock this world Seth Apter!!! And now I’m a lover of Stencil Girl.... there is no ending!!! Thank you!!! The way you used the color variety of the embossing powders is really effective! So many fantastic products. Everything waits while I create and dream the day away. I have recently purchased a couple of pots of emerald Creek embossing powders. I am really enjoying them. Thanks for all the inspiration. The textures created by your line of embossing powder is amazing. Can't wait to ry the technique and get my hands on these powders. Love, love, love your circle stencils. I use them often. Love your work Seth!! Thanks for this inspiration, I just got back into embossing! Love this Seth! The colors are perfect. What’s not to love.... circles just make me happy. alobe the colours and textures. Fabulous. Love the shades of these embossing powders and how you used multiple colors with this stencil. Great effect! REally a wonderful piece. The embossing is so rich and colorful and I love the strips of interesting pieces around the outside! I love the effect of the different colors of EP next to each other!It looks like mosaic tiles! Great choice of stencils and embossingpowders. Love it!!! Love everything about it, Seth! Love all of the texture!! Beautiful! Such gorgeous textures and colors! As always Seth you continue to inspire me. Great piece using your EC bake-ons, They are so much FUN! your work is always stunning and I really love the information of stencils and embossing powder on this one. Emerald Creek is such a unique product. Can't go wrong with Seth's stencils. And the little minis work for so many things I can't even fathom being without them. I want those baked textures so bad! They look so great with this stencil combo! Very creative stenciling and yes, I grinned! Seth, Loved your creation and how you incorporated the embossing powder. So creative! I love embossing powders and the emerald creek ones are high on my wish list. Combined with these wonderful stencils, there are just so many possibilities. love the combination of the stencils and your embossing powders!! This makes me think of ancient Celtic designs So beautiful - both the stencils and the powder. Texture!! This is so cool Seth! Love the colours and textures. Can't wait to try this. 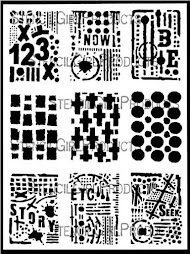 Oh, wow, I can't wait to try combining these stencils! I need a week of Saturdays! As always, I absolutely love the color and texture here. The separate segments of the different embossing poweders make me so happy! Beautiful color choices and design! Unbelievable! I adore the texture you obtained and the colors. The stencils beauty is also amazing!! Thanks for the giveaway opportunity! Wow! Love the texture! Looks like granite or something. Very very nice work! I’m inspired! Oh, those embossing powders are so yummy! The mixes of the colors are just fab, and those stencil designs are sweet too. Of course, you're a master and make everything look awesome. Love the watery Earth tones! Love the artwork Seth! Hope I win! What a beautiful pairing. Takes your breath away. Wow, Seth, this is really cool! I love how this looks like stone tile! Really amazing idea and technique! That is a totally cool piece!!!! LOVE it! Wow!!! Awesome project and technique!!! Simply love this piece! 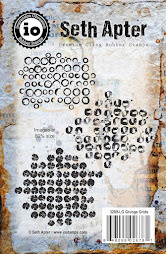 I love my Baked Textures and StencilGirl stencils! I love that they are small independent businesses. I’d love to win! Awesome Seth! This piece looks like it's made with little pieces of rock! Very cool. Amazing as always! Thanks for the chance to win! Makes my heart beat a bit faster. This is amazing this embossing powder is fantastic! You are the reason I love using embossing powder Seth, way back on Make It Artsy with Julie, and I am loving your new line, they are great fun to work with. As you so rightly said Seth, those stencils and embossing powders truly are a match made in heaven, especially in your skilful hands. Your work and products are always so inspiring. This piece is cohesive and rich with texture. Makes me want to get up and emboss a bunch of things and finish them off with a big coat of Vintage Beeswax. Thanks to you and Emerald Creek my creative dreams are possible. Love it and I was lucky enough to see it in person at Clipper Street. Amazing!!!! I love all the different embossing in the sections of the halo! That'd make a great page in my embossing powder sampler! 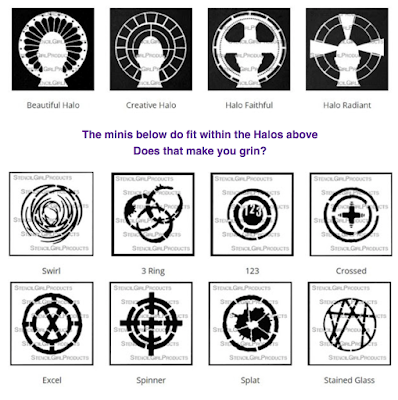 Love the halo squares! Really nice! 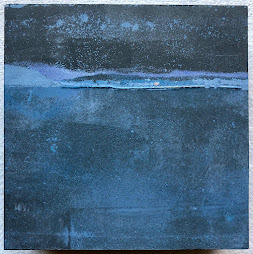 Seth, this work is stunning! I think the colors are so appealing...and am sure the texture is amazing! Because it is on watercolor paper, did it have to e behind glass? Seth, I love your textured embossing powders! I am unfamiliar with StencilGirl, have to give them a try now. Absolutely love this piece! The halo part reminds me of the old view master reels ( i think i may have just made myself sound old there)! So full of texture I just want to touch it! What a coincidence that your circles fit inside Pam's stencils. Great combination.